This is a MV Series Mirco Drill. The MV Series are ideal for through holes and blind via hole drilling. 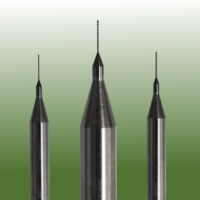 These drills are made of hyper fine grade carbide alloy to ensure they are robust. STX series have elongated flutes in comparison to the equivalent standard version in the same diameter. Please note: We only sell Micro Drills in packs of ten.